Having led from the beginning of the competition it was a disappointment for Guilfoyle to finish in third place today. There is now only one race left for the final day of racing tomorrow (Fri) and Séafra lies 7 points off the Spanish leader Joel Rodriquez Perez and six points off Ryan Lo of Singapore. It’s a wonderful achievement to be sailing at this level in this position and shows how high our expectations of our sailors now are. Anything can happen tomorrow and we will have to wait and see how it plays out. We do wish Séafra the very best of luck. 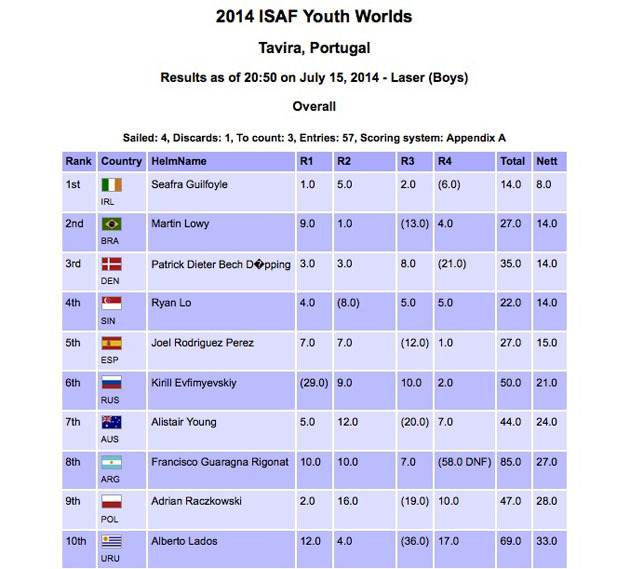 After Day Three of the ISAF Youth World Championships at Tavira, Portugal, Séafra is still placed first overall with a 10 point cushion. Today he counted a 5th and 17th but he was able to discard the 17th and reintroduce his 6th result from Race Four. 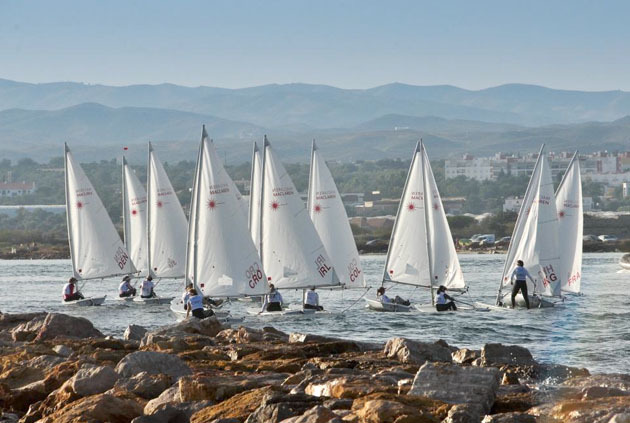 The Argentinian sailor Franisco Guaragna Riconat scored two wins today in the extremely light airs and now lies second. Meanwhile, in the 29er fleet Sean Donnelly and Patrick Crosbie gained a place and now lie in 22nd position overall. 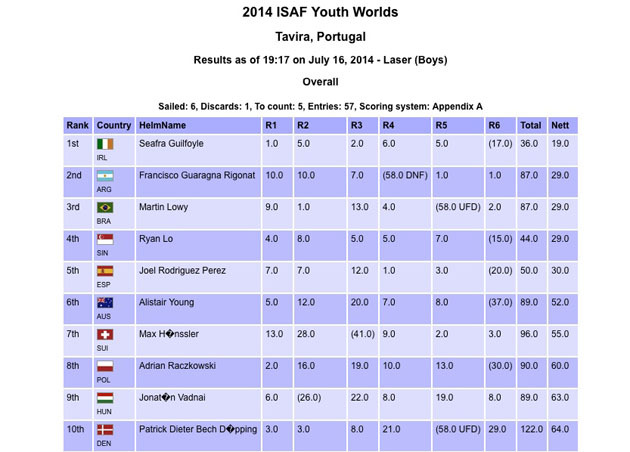 Séafra Guilfoyle has now consolidated his lead in the Boys Laser Radial Class at Tavira. His results were a two and a six placing him in first position on 8 points including one discard. Brazil, Denmark and Singapore follow in that order on 14 points each with Singapore in fifth place on 15 points. Séafra, the current All Ireland Junior Champion, placed 15th overall at a recent Europa Cup event and clocked up a splendid 6th overall position at the recent European Lasers Youth Championship in Denmark. In the 29er Class Sean Donnelly and Patrick Crosbie slipped a little today and are currently lying in 23rd position.